Fan coil filters or Circaframes are a metal wire framed filter with a filter media stretched and stitched around the circumference of the metal carrier frame. Once the circumference of the frame exceeds a certain figure then cross wire supports are added that give additional rigidity to the frame structure. These types of filters are a washable or semi-washable panel used in small air conditioners and fan coil units, warm air furnaces, electronic cabinets and refridgeration counters. 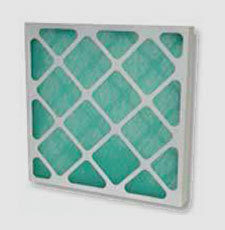 They are a low air resistance filter designed to protect the heat exchanger coils from fluff build up. Reticulated Foam A polyether foam that is fully water resistant. This media may be washed and re- used a number of times. The foam eventually becomes brittle and has to be disposed. 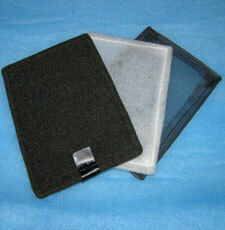 Synthetic filter fleece A polyester media in either G2 or G3 rating. May be gently cleaned once or twice, but designed as a disposable item. 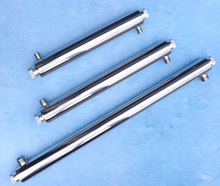 We can also supply this media as a sleeve to slide over the wire frame. You then dispose the media only retaining the wire frame for re-use with clean media sleeve. Fly screen mesh Mesh fly screen media. May be gently washed and reused. Glass Air Filters have been designed for use with Air Handling plant, either on its own or as a pre-filter for more sophisticated filtration systems. The panel provides the economic answer for the specifier when initial and replacement costs are of prime importance. Filter perfomance to G3. Glass is a 100% continuous glass filament, developed specially for air filtration. Glass will not absorb moisture, has excellent water stripping properties and is fire resistant. Electronic programming techniques produce a controlled media pattern which has an open structure on the upstream face and which graduates in density to the integral laminate backing on the downstream side. This gives two stage filtration. The open structure of the face discourages surface loading and promotes filtration in depth to ensure high dust holding capacity with minimum resistance to air flow. The denser backing provides fine filtration and prevents carry over of media fibres and collected dirt. Manufactured from heavy duty moisture resistant card with supporting card lattice on both faces. Standard frames are either 47mm thick or 23mm thick. Non standard sizes are available to order. The filter media used in all filters is a high performance, non-woven, reinforced cotton rayon fabric. Media is available with an efficiency rating of G4 up to F8 rated to EN779.2002. The media support is an 'expanded diamond' grid with 98% open area. The filter media is chemically bonded to the media support filter media to ensure pleat stability throughout the filter. The filter employs a special radical vee pleat design not exclusive. This guarantees total usage of filter media, and maximum dust holding capacity. This affords the user a greatly extended service life. The enclosing frame is constructed of rigid, heavy duty, moisture resistant chipboard. 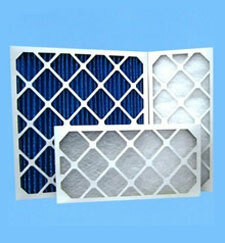 The filter pack is bonded to the Inside periphery of the frame to prevent air bypass. Each filter operates on a strainer type principle, utilising pleats that are shaped and spaced on predetermined centres. This controlled spacing causes diffusion of air pressures over the pleated surface . Initially the least resistance is in the bottom of the pleat where pollutants are filtered out. A build-up of these contaminants increases the resistance at the bottom of the pleat, and air flow gradually moves up on the side walls of the pleat as the filter becomes loaded. The larger pollutants in the air stream, because of their velocity and inertia forces, are unable to change direction as the air flow moves up the side walls of the pleat, and these pollutants lodge themselves in the back of the pleat while the finer microscopic particles become trapped on the side walls. As dirty air angles though the pleat sides, increased media loft (created by particulate layer build-up) is achieved, with the result of better micron efficiency. This is the strainer principle of filtration. The pollutant bed functions as a supplemental filtration medium throughout the filter life.